Jumping on turtles, hitting your head on suspended brick ceilings and eating mushrooms to grow in size are activities every kid has experienced since 1983. Still, if your parents never bought you a Nintendo game console then you must be feeling a great frustration. Your anger is righteous, because being robbed of Mario is like being robbed of your childhood. Actually I'm not serious, I just heard this somewhere. I have briefly played a PC port of Mario and then dedicated my attention to SU-27 Flanker ...along with the constant struggle to land it once without crashing. Nevertheless I bet that bumping into a lumbering mushroom and falling off the screen is equally as frustrating. Returning to the subject matter; you'll be delighted to know that a guy from Poland recreated Mario in its full glory on PC. The challenge of making a video game on your own is pretty monumental when you think that today's games are produced by an army of developers. Yet, this was not uncommon twenty years ago. For example Eric Chahi's Another World was a one man job and remained revered as one of the most influential games ever made. At first glance though what sets SMF apart from AW is a good dose of digital mescaline. Now, I'm not actually comparing Super Mario Forever to Another World. It's just that the background colors and animations of Super Mario Forever are so very trippy. I'm not sure Mario really needs another mushroom to 1UP himself. Game play on the other hand reminds me of the old days when side scrolling game characters would make awkwardly long and hard to control jumps. This eventually gets less difficult. It actually becomes quite charming. Except for the wall-jump feature that when executed, propels Mario off the wall, strait in the other direction with no questions asked. This could be frustrating at times where you just needed a couple of pixels more to reach that ledge. The instinct usually pushes you to wall jump in order to supplement your lack of height; not in Super Mario Forever though. You will just need to unlearn that reaction. Besides jumping to navigate. 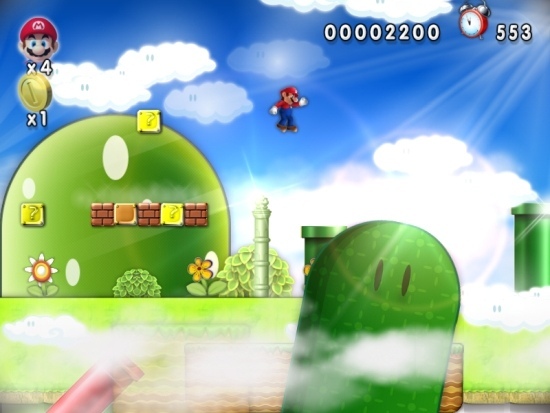 Mario also can also jump on enemies and enter pipes, just like in the original. The levels also feature side areas that offer bonus coins and other goodies. So be on a lookout for stray pipe openings. The action spans across 15 levels in the first map. There also 7 additional maps to unlock later. Enemies that you encounter are the familiar ones in general, so I won't enter in any detail, partly because I don't want to prolong this quick review, mind you. Still, there is a big technical problem that bugs me. Once you started playing there is no way to exit the game. If you lose all of your lives and chose to quit, you will get stuck. Starting the game again will then put you in the same screen and unable to continue playing unless you re-install the whole shebang! So my advice is to always close the game using the Task Manager (Ctrl+Alt+Del) and always select Continue after losing. Super Mario Forever is ripping off everything from the original Mario games. Yet who cares when it's totally free. Michal Gadniac really managed to create a convincing Mario game and for that, at least it deserves to be tried. Besides, you get to hear Princess Peach speak in a monotone voice and curse that you need to re-install it from accidentally selecting to quit. It's a treat!